When cooking fish, most people cook the fish separate by frying - this is to avoid a strong fish aroma, this method is two phased to fry the fish to get crispy but finish in the oven to still keep it juicy. The Faskar fish is also regarded as sustainable for the time being as it has not yet been overfished. Be more sustainable this Ramadan! Heat the oil and sauté the onions slowly till brown. Remove, drain on paper towel and set aside. Fry off the fish in the same oil till almost cooked through, remove from oil and season with the Knorr Coating Mix Marinade, fish sauce and cumin, place in baking tray and reserve till rice is almost cooked. Heat the Rafhan Corn Oil, add the rice to heat up in the oil. Then add dried lemons and Knorr Coating Mix Marinade and stir gently so not to break up the rice. Add Knorr Chicken Cube and water, bring to a boil, lower to a simmer for 10 min, then cover with a lid and steam till cooked through. Pre-heat the oven to 180°C and finish baking the fish. Mix the Knorr Lime Seasoning with water and drizzle over the fish. 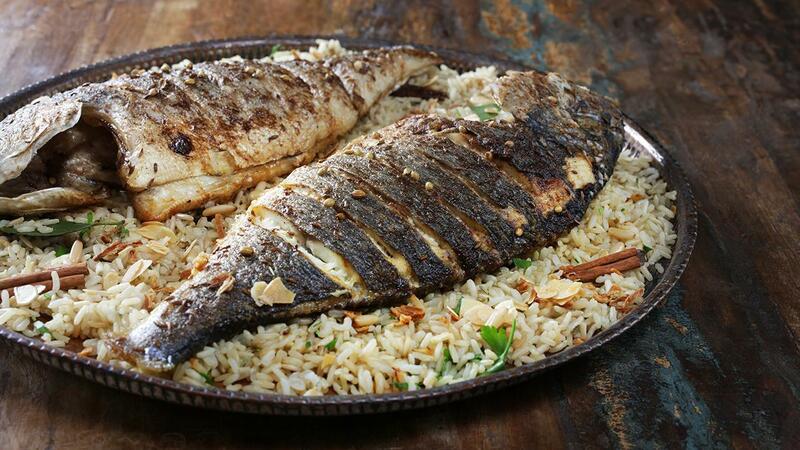 Plate the rice, top with the fish the garnish with nuts caramelized onion and parsley.